All kinds of fences and gates. Attractive and practical. Residential or commercial. Work is fast and dependable. 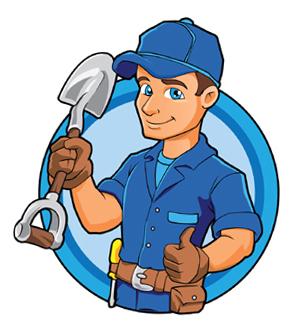 Professional and friendly installation crews. Looking to put up a security or privacy fence? It’s best to have an experienced local fence company build yours. Homeowners often want a fence to provide privacy from neighbors, security, safety for children or pets, or to make their home look better. Your installer will work with you to determine your wants, needs, budget and personal tastes and show you some awesome options for your home. You have access to all kinds of different products from leading manufacturers. They make sure that your new fence will match well with the architecture and style of your home, be it modern or rustic. And your builder can suggest the finishing touches or accessories that will really make your fence look good. A good builder will show you examples of stylish but tough materials that are right for this part of the country and will stand up to the elements here in our area. Lastly, they will make sure to adhere to all city laws and regulations regarding residential fencing around town. They can meet with a potential commercial client, check out the property and come up with a few affordable and appropriate solutions to choose from. They will design a solution that is made up quality materials, is strong and durable, easy to maintain, looks good and promotes safety at your business. Besides outdoors, they can also design and assemble interior partitions and cages for inside warehouses, storage facilities or other commercial buildings. You have several options when it comes to planning your new fence. The two biggest options are whether you want a privacy or a non-privacy fence and which construction materials you want the fence built with. Chain Link – generally the cheapest option. It can be the quickest and easiest to install. May have a galvanized option. Galvanized chain link will come with a heavy zinc coating, so no corrosion or rusting. Vinyl or PVC Coated Chain Link – chain link covered with a shiny, protective vinyl coat. It’s maintenance free. Often available in colors including black, brown and green. California Chain Link – a hybrid style using chain link fence, but having wood posts and wood beams instead of the standard steel posts and beams. Barbed Wire and Barbed Tape – very effective for security situations. Steel – durable/built to last and secure/strong. Resistant to weather damage. Plenty of design choices and different grades/costs to choose from. Can be ornamental. Ornamental Iron, Aluminum or Steel – a big range of style designs, colors, and options including different styles of gates. Great-looking but more expensive. Vinyl – affordable, easy to maintain/maintenance free, durable/weather resistant and maintains its look/shape/color for years. Comes in a range of styles/textures/colors and accessories. Good for privacy. Composite – similar to vinyl, but usually is a blend of synthetic PVC vinyl and recycled wood fiber materials designed to resemble the look of timber and wood. The finish is resistant to mold, cracking, chipping, peeling and rotting. Good for privacy. Wood Picket – traditional and classic. Not weatherproof or maintenance free. Wood or Timber – classic warmth and traditional style. Blends well with nature and the outdoors. Can be good for privacy situations. Not weatherproof or maintenance free. Split Rail – traditional, timber poles positioned horizontally and vertically. No privacy or security. Has a rustic, rural feel to it. Typically residential. An affordable option, especially for large areas. Security options include manual or automatic pedestrian walk-through gates for home or business use; pedestrian turnstiles and other entry access systems for business use; driveway gates or entrance way vehicle gates that either swing or slide; and the gate operators that provide controls to open and close these gates (card readers, coded keypads, radio controls or simply manual operation). There are appearance details you can add to your fence too. There are finials and caps which sit on the top of your fence posts. Finials are generally just a decorative element. Caps help provide a finished look too, but they can also help protect your post from the weather. Scrolls are a decorative element that can be added to the top or middle of fence sections or gates of see-through fences. If you just need a temporary fence, you can get that done quickly too. 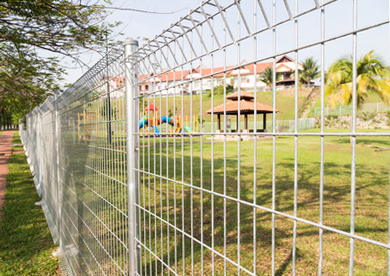 Construction work sites and other types of outdoor projects often need a protective security fence for just a set amount of time. 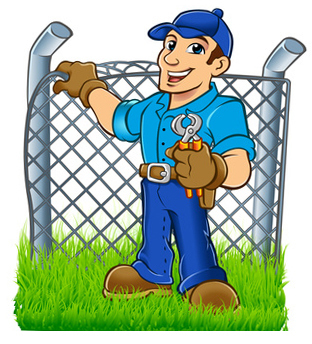 A good fence contractor can install an effective temporary fence to protect whatever it is you want to be protected. Generally, a temporary fence will not be a good-looking fence. It’s purpose is to protect whatever is inside it or to keep bystanders or neighbors from getting into the location and potentially being harmed. Some temporary fencing may incorporate nylon or other light weight choices. Building a privacy or security fence doesn’t necessarily require that a rocket scientist be in charge of it, but at the same time, it is harder than it looks. An experienced fence builder knows all the tips and tricks concerning how to design, lay out and construct a good-looking fence. Let’s be honest – novices and beginners make mistakes. And it will take an inexperienced installer three times as long to finish even a simple project. Plus, the last thing you want is to end up with a fence that looks like it was installed by an amateur. Or one that violates a city building code. If you set up a short meeting with a local security fence installer, they can take a look at your property. Your local contractor can find out exactly what it is you’re looking for, offer a few recommendations, show you the best available options and come up with a plan and an estimate of how much it would cost. You can also find out when your project will get underway and when it will be finished. Find the right company for your budget. It takes just a short phone call to move forward with the info you need. Working on homes and businesses all around the West Coast, from Seattle to San Diego and over to greater Phoenix. Just call when you have a couple of minutes.